1. Cut your bread into slices and place on an oven tray and toast. Or, if you are using larger pieces, cook in the toaster, panini maker, or vertical grill. You know - just TOAST it however! Bread with large air holes is NOT what you want. 2. While your toasted bread is cooling, skin your garlic. 3. Rub the underside of your toasted bread (and the edges if you are keen) with the garlic bulbs. 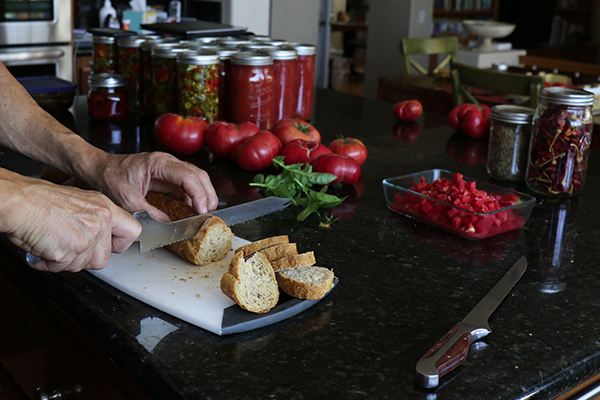 Each bread piece can use up a third to a half a clove of garlic - easy. 4. 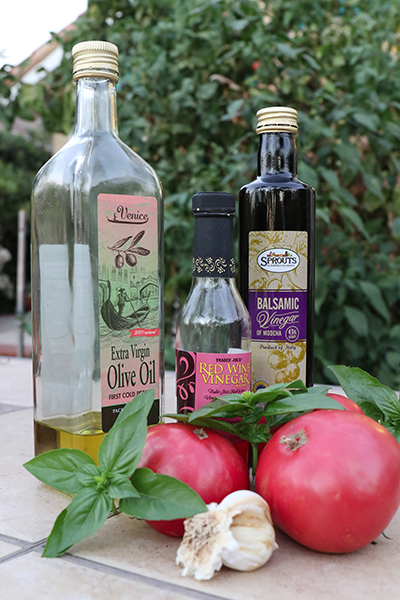 Mix up the olive oil, vinegars, salt and lemon juice in a screw top jar. 5. 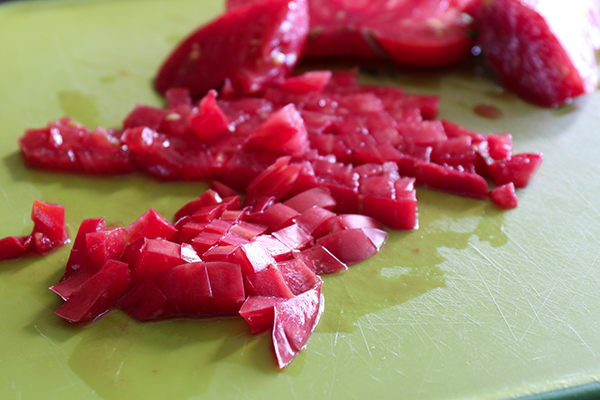 Chop your tomato quite small (maybe 1/3" cubes) using a very sharp knife and place in glass bowl. 6. 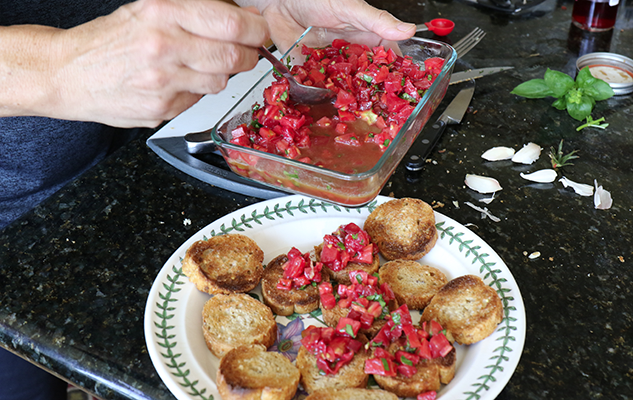 Chop your basil into fairly small pieces and add to tomato. 7. Let tomato rest for 5 minutes or so then drain off excess liquid. 8. Vigorously shake dressing and check taste. Adjust as needed, then add to the tomatoes and basil and gently mix. 9. 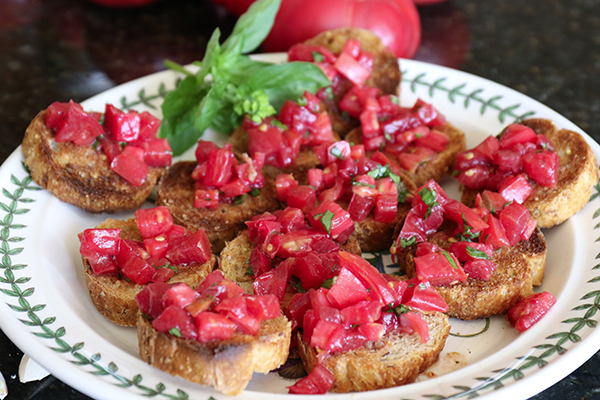 Using a spoon, scoop onto toast pieces and enjoy!